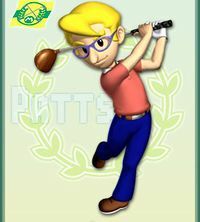 Putts is a human in the Mario Golf series. He had always focused on his future, but since winning the Marion Cup, this focus dwindled. He speaks with an advanced vocabulary and appears as intelligent as Gene, if not as self-absorbed. When he loses, Putts tends to grieve, despite being weaker than the other champions. Eventually, though, he recognizes the caliber of his victorious opponents and overcomes this grief. In Mario Golf: Advance Tour, Joe became the new Marion champion. Putts then focused on his doubles game with him. He was the champion of the Marion Cup before Neil and Ella defeated them. In Mario Golf, Putts is a short man with gelled blond hair, a round nose, and beady eyes. He wears a white-collared orange polo shirt, a brown belt, and white pants. His golfing shoes are chestnut brown and his golfing glove is white. His trademark is his glasses. In Mario Golf: Advance Tour, Putts had fewer design changes than most other characters. He now wears a white-collared coral pink polo shirt and blue jeans, though his shoes and glove remain unchanged. His glasses now have a sky-blue colored rim. I am a French, Paris bred golf player. Recently, I was chosen as a club champion, I guess my strength has been accepted at last. I was called rookie from the other players, but I think that day, I will be the top club champion! I am the one who plays with my head and I call myself ID golf. If I could just get a bit more strength, I can easily win. His name is a pun of the golfing term putt. It was said in Mario Golf: Advance Tour that Putts was short. According to his profile in the Japanese Mario Golf website, Putts was taught golf in Paris. It was hinted in the Japanese Mario Golf website profile of Gene that Putts was believed to be capable of defeating him; however, he then stated that it would take 100 years of experience before Putts would be able to best him. This page was last edited on March 18, 2019, at 22:25.